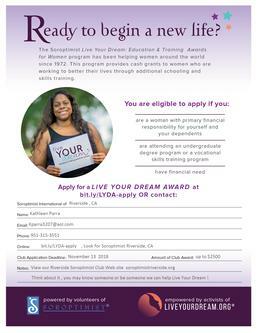 The Live Your Dream Education & Training Award (LYDETA) aids women seeking to improve their economic status by gaining additional skills, training and education. The program helps women who, as the primary wage earners for their families, must enter or return to the work force. The women may use the cash award to offset any costs associated with their efforts to attain higher education, including books, child care and transportation costs. Many LYDETA winners are domestic abuse survivors who use the funds to help rebuild their lives through improved employment opportunities. Winners of the club-level award will compete for additional recognition at other levels of the Soroptimist International organization. Each year more than $1.7 million is awarded through the LYD program. Since the program began in 1972, it is estimated that $30 million have been disbursed to help women achieve their dreams of a better life. They provide the primary financial support for her household. Dependents may be children, spouse partner, siblings and/or parents. They are enrolled in or has been accepted to a vocational/skills training program or an undergraduate degree program. They cannot have a graduate degree. They are not a previous recipient of this award. They are not a Soroptimist member or an immediate family member.